Strangely enough, after years of not reading Usagi I finally gave it a try with this TP. I didn´t really know the characters, didn´t know that Gen is supposed to be Usagi´s buddy and without his horn in later appearances. Not necessarily the best introduction to the Usagi cosmos but still a fairly entertaining read. Now that you read 27 TPs, do you plan on reading Usagi Yojimbo: Yokai? 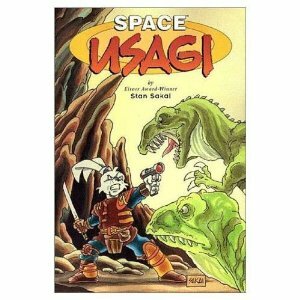 The original graphic novel for Usagi´s 25th birthday in full color, fully painted by Stan Sakai? Ah, I love Usagi Yojimbo. Stan Sakai is a master of his craft. I definately want to check out Yokai. Watch this space. Yokai will be arriving soon! Very soon. Just finished this one. Much as I love seeing characters out of their usual context, I’d agree that this one missed the mark somewhat.